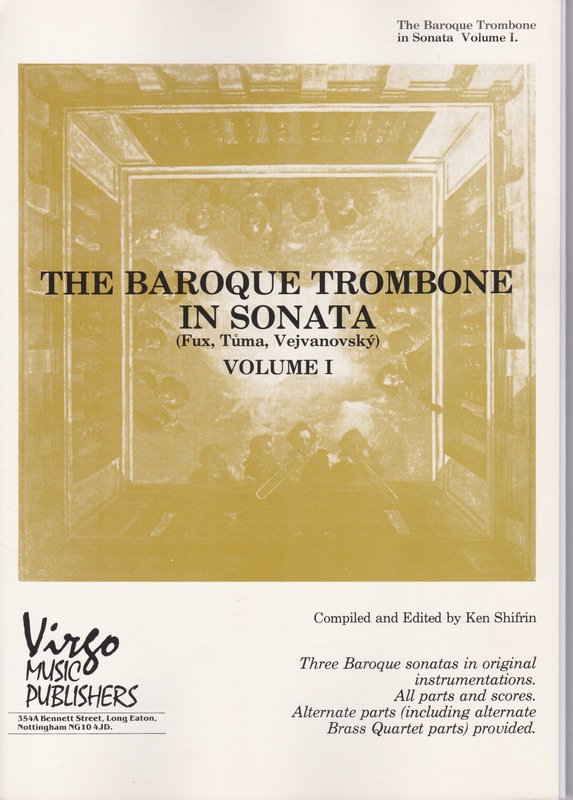 The Baroque Trombone in Sonata Volume 1 is a compilation of three sonatas by Baroque composers Johann Joseph Fux, František Ignác Antonín T?ma, and Pavel Josef Vejvanovský. Ken Shifrin, former Principal Trombone of the City of Birmingham Symphony Orchestra in England, has compiled and edited these three sonatas, keeping them in their original keys as well as including the original and alternate instrumentations for each composition. Pieces included include Fux’s Sonata a Quatro (violin, trumpet, trombone, bassoon, basso continuo), T?ma’s Sonata a Quatro (2 violins, 2 trombones, basso continuo), and Vejvanovský’s Sonata a Tre (violin, trumpet, trombone, basso continuo). Each sonata is written for four players, which can be assigned to either of the following instruments - Part 1: Violin (I) or Trumpet (I), Part 2: Trumpet (I) or Violin (2), Part 3: Alto Trombone or Horn in F, and Part 4: Bassoon or Trombone (II). Parts I and II are written in C; Part 3 includes separate music for alto trombone in alto clef and horn in F; and Part 4 is written in bass clef. Although designated for alto trombone, Part 3 extends up to d2 and may be played on tenor trombone. Shifrin includes suggested tempi and embellishments and states that “phrasing, dynamics and articulations are best left to the ensemble to determine, as is the choice of keyboard instrument that best complements the make-up of the particular ensemble.” When looking to program Baroque music other than Bach, these three sonatas, performed together or individually will make a fine addition to your next recital or concert program.